HiNGE is an original work of theater that blends elements of gaming, cooperation, and improvisation into the telling of a complex story. 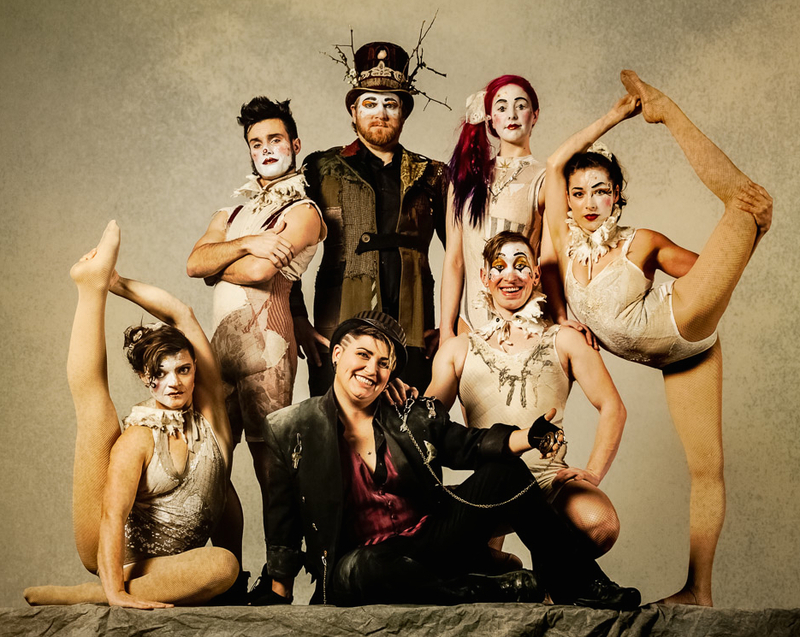 It is the creation of Bunny Holmes, founder & director of the Vespertine Circus LLC, and a sponsored project of the nonprofit organization, Fractured Atlas. See full credits for HiNGE, here. HiNGE is set at the final dress rehearsal before opening night at a touring circus. It contains two parallel stories: the drama of seven actors at work, and the comedic circus show they are struggling to rehearse. This is a rare pairing of traditional narrative theater, and the splendor and spectacle of circus. The best part? Audiences are invited to participate in the “rehearsal” as technicians with real sway over the outcome of the show. The design of HiNGE allows for many styles of audience participation which affect the pacing, look, and sound of the show in real time. Clowning routines and over-the-top antics mix with an underlying drama written to highlight the unseen hardships of living on a touring circus. The “actors’ story” portion of HiNGE reveals the contrast between the personal lives of the artists and the seemingly superhuman feats they achieve when performing. Who is underneath the stage persona? What are we capable of doing in spite of our struggles? 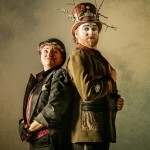 Whether it’s two acrobats who are fighting when expected to perform routines that demand complete trust, the act of sacrificing a comfortable life at home to travel with a troupe of strangers, or of fighting the forces of artistic stagnation, the challenges that come with circus life are as emotional as they are physical. Ultimately, HiNGE is a story about diverse people coming together to follow a beautiful dream. The show changes based on audience input, so the path of our story will never be exactly the same twice. The story revolves around Ringmaster Jack Kastner, five interdisciplinary acrobats, and the head technician, Rousty. Dialogue is using sparingly, most of the story is conveyed through physical acting and the circus acts themselves. These acts include: clowning; aerial silks, aerial hoop, aerial frame, and duo straps; duo tight-wire dance; Cyr wheel; unicycle; juggling; contortion; and puppetry. In order to fully evoke HiNGE‘s otherworldly, fairytale setting, great care was taken in selecting costume designers. Gibbous Fashions and Subverse Industries have teamed up to craft costumes that are reminiscent of an Alexander McQueen runway show, complete with lots of nature-inspired details and a lush use of texture in fabric selection. 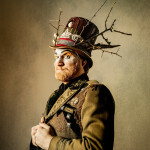 Characters wear iconic asymmetrical makeup designs to reflect the two parallel stories taking place, the story of the actors and the circus show itself. Our two composers, Andrew Lowe and Jesse Buddington, have written a timeless and genre-defiant score. Lowe comes from a background of electronic and dance music production, while Buddington is a classically trained opera and renaissance singer. Together they have joined strengths to build an aural landscape as surreal and lovely as the costumes. The multi-layered, pre-recorded score works on a spectrum from very simple and beautiful melodies to a full and complex soundscape depending on audience input and direction. Along with your ticket, guests will receive a download link for a location-sensitive iPhone app. While not essential for interacting with or enjoying the show, the app gives you more story content to those who feel like exploring the theater with it. Go on, play with your phone at the theater, we invite you. Artist Clody Phoenix Cates has crafted a tour-friendly set of “Victorian-paper-diorama” style stage flats, similar in style to those seen in the Imaginarium of Dr Parnassus or Baron Munchausen. The flats mix imagery from both architecture and nature in a vision inspired by urban exploration and the hauntingly beautiful process of nature reclaiming an abandoned fairground. In addition to the landscape Cates has built for our stage, the set (like the production itself) begins in the lobby with an interactive sculpture begging to be touched.